February 22, 2016 by SANDRA M.
This piece was a beautiful addition to our bedroom and the delivery people were exceptional in their service. I would recommend this site as well as this piece for anyone looking for good quality, unique furniture. 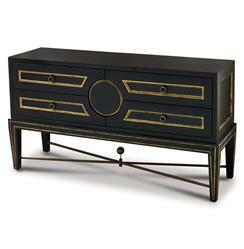 This opulent black console cabinet offers storage and style. It holds four generously-sized wood drawers with gold-finished solid brass pulls on each. Antique gold gilt trim adds a luminous accent to this onyx-finished chest of drawers. The versatile piece could also be paired with a large mirror for an oversized, glamorous vanity.